Thank you to my friends at Nasopure for sponsoring this Spicy Coconut Soup Recipe post. As always, all opinions are 100% my own. This Spicy Coconut Soup Recipe is perfect when you’re feeling under the weather or just want a comforting meal. It’s vegan, gluten-free, and quick to make. Whenever I’m craving soup, I head to my local Thai restaurant and order their delicious veggie coconut soup. It’s creamy and comforting, and the spices make me feel better when I have a cold or sinus issues. And I also love other spicy recipes like Peanut Sauce Tofu and Sriracha Tofu Egg Salad. Unfortunately, my nasal problems occur more frequently than I would like. Do you suffer from sinusitis or seasonal allergies? I sure do. That’s why I was so excited when Nasopure sent me their nasal wash kit to try. Maybe you’re wondering what this has to do with cooking and recipes. Well, I find it very difficult to cook or enjoy food if I can’t taste it because my nose is stuffed up. It’s no wonder spicy foods seem appealing when you’re congested. 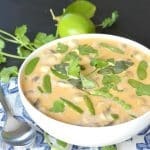 And I always turn to foods like this Spicy Coconut Soup Recipe when I have a sinus infection. But the last time I had to see the doctor for a sinus infection, he told me I needed to use a neti pot to clean my nasal passages. However, try as I might, I just couldn’t do it. I felt like I was drowning when I attempted to use it. And the solution would go down my throat. It was terrible! So I admit I was a little nervous to try the Nasopure system the first time. I was successful the very first time I tried it! It was so easy! I read the directions and didn’t have any problems. Plus it didn’t feel uncomfortable or give me the sense I was drowning. And the folks at Nasopure have been kind enough to let me host a giveaway so you can try their products, too! 10 winners total will receive the following: 3 Sampler Kits, 1 Little Sampler Kit, 1 Personal Refill Kit, Dr. Hana’s Book – ‘Clearing the Air One Nose at A Time’. Now let’s get to the Spicy Coconut Soup Recipe! This Spicy Coconut Soup Recipe is perfect when you're feeling under the weather or just want a comforting meal. It's vegan, gluten-free, and quick to make. Add the coconut milk, vegetable broth or water, and ginger to a small pot. Bring to a boil over medium heat. Stir in the mushrooms, sugar snap peas, tamari, red curry paste, lime juice, and agave. Reduce the heat and simmer for about 5 minutes, until the vegetables are tender, stirring occasionally. Remove from heat. Garnish with basil and/or cilantro, if desired. Serve with Sriracha hot sauce on the side if you want some extra spice. I love Nasopure! Dr. Hana lived in the same town as me when I started using one before I was vegan. Going vegan and eliminating dairy really helped, but Nasopure is my second favorite help! No way! That is so cool! I can’t believe I only just discovered Nasopure. It’s really helping me! Yummm! I made this the other night and it was simple, warm and satisfying. Of course the beauty of cooking at home is tweaking a recipe to suit your taste. I used lite coconut milk, not full fat. I left out the ginger. It’s not my favorite and I’m too lazy to grate it. I used broth, not water. Next time I might use half broth and half water so that the coconut flavor bursts through. It was very good with all broth but I’d like even more coconut. I used sliced mushrooms and then cut those in half. I love mushrooms and I think this added more flavor and more bites to the soup. I also cut the snap peas into bite size pieces. It’s not as pretty but easier for eating. I only had 2 little tsp. of red curry paste left so I used it all. I would start with 1 Tbsp.next time and adjust up from there. I also added more lime juice as that’s a flavor I love. Finally…I added about a cup of diced soft tofu. It took on the broth flavor, added protein and added another wonderful bite to each spoonful. Really, this came together easily and was perfect on a cold night. Sounds wonderful, Sue! I love how you made it to suit your taste. I’m so happy you enjoyed it! I made this. I added extra red curry paste, crab and rice noodles to the original recipe. It’s delish! This soup was good- but needed a lot of work. I tripled the amount of ginger, added a clove of garlic, used soy sauce instead of tamari and sugar instead of agave (1.5 tbsp each), and added half of a second can of coconut milk. I added some red pepper flakes instead of Sriracha. You’ll also need plenty of salt and black pepper. The soup still wasn’t super filling, so I served it with brown rice inside, which also added more texture. Pleased with the results!